Both Project and Equipment posts use Essential Grid Custom Type Post. To access Essential Grid Posts, navigate to this following url : [your_domain/wp-admin/edit.php?post_type=essential_grid](your_domain/wp-admin/edit.php? We have modified Essential Grid Custom Type Post to allow user to change its name and its permalink. Go to Settings sub tab to configure them. Step 1 – Navigate to this following url : your_domain/wp-admin/edit.php?post_type=essential_grid then click ‘Add New’ sub tab. Step 2 – Enter your Project / Equipment title in the upper field. Step 3 – Make sure you have Backend Editor mode selected. 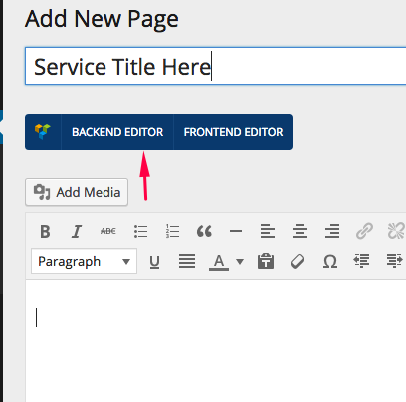 If you have not, you will see Backend Editor button appear under Page Title, then click it. Step 5 – Select Project Layout ( or Equipment Layout ). It might take a while for your machine to render the layout. Please wait and do no interrupt the process. Step 6 – Once the layout is loaded. Simply replace texts, titles, and images with your own content. Step 1 – You need to use Essential Grid Plugin in order to list your Service posts. Make sure Essential Grid plugin is installed and activated. Step 2 – Go to to Dashboard > Ess. Grid > Import / Export. Click on Import , choose the Essential Grid demo file under Demo Content/Essential Grid, pick one file based on the theme you are working on, then click Import. Step 3 – Navigate to Dashboard > Ess. Grid , click on the Settings ( green button ) for Projects ( or Equipment). Step 4 – Click Source tab, select Post Types to Services ( or any name Post Types and specify the Post Categories. Leave other settings as is. Step 5 – Click Save Grid green button at top right of the browser window. Step 6 – Choose your grid , then hit Add Selected Grid. Step 7 – Publish the page.